Here is the comparison of 15 best free cloud storage services. Cloud storage has become very popular nowadays, and there are lot of good cloud storage services out there, that offer lot of unique features. For a normal user, it sometimes becomes difficult to determine which cloud service to go for. To help you in deciding which cloud service is best for you, I have done this exhaustive comparison. I have compared the best free cloud storage services: Dropbox, Google Drive, Box, OneDrive, Tresorit, DataBagg, Bitcasa, ASUS WebStorage, IDrive, MEGA, pCloud, Inbox Storage, Copy.com, SpiderOak, and FlipDrive. I have compared the cloud storage services on following features: Free storage space, data encryption, single file size limit, supported OS, two-step verification, data sync, file sharing with others, file viewer and media player, etc. So, depending on the feature that is more important for you, you will know which service to go for. (Full Review) 2 GB (earn up to 16 GB via additional tasks) Yes: For data transfer and to store data on Dropbox servers. Yes No limit for desktop client and mobile apps. Up to 10 GB through website. Windows, Android, Windows Phone, iPhone, iPad, Windows Phone, BlackBerry, and Kindle Fire Yes Yes: Excel, Word, and PowerPoint files. Yes Yes Integrated with Microsoft Office Online to edit associated file types. (Full Review) 15 GB (earn extra space up to 20 GB) Yes: Only during data transfer and not for servers. Yes Up to 10 GB Windows, Mac, iOS, Android, Xbox 360, Windows Phone, and Google Chrome Yes Yes: Office documents and text files. File Viewer Yes Connect Skype account to chat and call. (Full Review) 15 GB Yes, but not on servers. Yes 5 TB except Google Docs, Sheets, and Presentations. Windows, Mac, iOS, and Android. Yes Yes Yes Yes Create surveys, chat with collaborators, etc. (Full Review) 10 GB Yes: Both for data transfer and for servers. Yes 250 MB Windows, Linux, iPhone, iPad, Android, Windows Phone, and BlackBerry. Yes Yes: via third-party application Yes, but cannot play video files. No Add task or comment to a file, and mark files favorite. (Full Review) 50 GB Yes: End to End Encryption. No Unlimited. Windows, Mac, Linux, Android, BlackBerry, iOS, Windows Phone, Firefox and Google Chrome App Yes No Image Viewer Only No Browser based chat and video calling will come in future. (Full Review) 3 GB (earn 2 GB extra space) Yes: For data transfer and for servers. Yes 0.5 GB Windows, Android, Windows Phone, BlackBerry, Mac, and iOS Yes No No Not in free plan. Send 10 encrypted links per month and maximum size of encrypted links is 100 MB. (Full Review) 5 GB (earn extra space up to 10 GB) Yes: To retrieve and backup data. Not available in free plan. 500 MB Windows, Linux, Mac, Android, iOS, and Windows Phone Yes No Yes Recent Changes feature. add messages (or comments) to files. (Full Review) 5 GB (earn extra space via referral) Yes: For Data transfer and for servers. No No limit. Windows, Android, iOS, Windows Phone, and BlackBerry Yes No Yes No Play animated GIFs, import contacts from Gmail and Outlook, 24/7 call/chat support. (Full Review) 5 GB Yes: data is first encrypted on client side and then stored on servers. No No limit for desktop client. 2 GB limit for web and mobile apps. Windows, Android, Linux, Mac, and iOS Yes No Yes No Deleted files are remain in trash for 30 days. (Full Review) 5 GB (earn extra space) Yes: For both transfer and storage. Yes No limit. Windows, Mac, Android, and iOS Yes No Image Viewer Yes Connect unlimited devices. (Full Review) 10 GB (earn extra space up to 10 GB) Yes: For data transfer. No No limit. Windows, Android, and iOS Yes No Yes Yes Separate sections available to check files Shared by you and Shared With you. (Full Review) 2 GB Yes: For data transfer and for servers. Yes No limit. Windows, Linux, Mac, Android, and iOS. Yes No Preview images and play audio files only. Yes: Using desktop client. Share room feature is available to share particular folders with desired people. (Full Review) 2 GB (earn extra space) Yes: For data transfer. No Not Specified. Windows, Android, Windows Phone, iOS Yes No No Yes Option to sync only a particular preset folder. (Full Review) 15 GB (earn extra space) Yes: For data transfer No No limit. Windows, Linux, Mac, Android, Windows Phone, and iOS Yes No Yes 30-day revision history. (Full Review) 5 GB (earn extra space) Yes: For data transfer. No 25 MB Web app and iOS Yes No Only Image Viewer No add bookmarks and contacts. The table above gives a nice comparison of the top free cloud storage services. So, which one is the best cloud storage service? Frankly, it is very difficult to find an absolute best, as each service has something unique to offer, and what might be important for someone might not be that important for someone else. Keeping that in mind, below I have summarized which services are the best for each feature. So, if there is one feature that is very important for you, you will know which service you should go for. In the end, I have still tried to give my favorite cloud storage services, which I believe have a good combination of different features. Winners: MEGA (50 GB), OneDrive (15 GB + Additional 20 GB), and Google Drive (15 GB). However, some people doubt whether MEGA would be around for a long time or not, since it’s from the same company which got shutdown by FBI. So in that case, OneDrive and Google Drive are the other two options. Among these two services, OneDrive can be a good choice as you can earn additional space up to 20 GB for free. Runners-Up: Copy, Box, and pCloud. Winner: Tresorit. It is so because it supports Client-side encryption with zero-knowledge privacy (your files won’t be decrypted on the cloud by anyone). Only you hold the key to decrypt your encrypted files. Runners-Up: DropBox, ASUS WebStorage, and SpiderOak. Two Step Authentication (2FA) adds an extra layer of security to your account. Those who are more conscious about the security of their accounts, they would like to definitely have this feature. Many cloud services support this feature: Box, Tresorit, OneDrive, Google Drive, Dropbox, SpiderOak, and IDrive. However, some of these services lack other features, say storage space, file viewer, etc. So, Google Drive and OneDrive can be the best choices in this regard. There are 8 cloud storage services in this post that come with the feature to upload a file without any limit. However, some of those services don’t provide huge amount of free storage space. So there won’t be any use of such services that provide too low a storage space and support unlimited file size. Keeping that in mind, I would suggest you to choose from OneDrive, Google Drive, and Copy. My favorite is ‘OneDrive’. Almost all the cloud storage services support most of the popular platforms (desktop client, Android, iOS, and Windows Phone). FlipDrive won’t be a good option as it is restricted to web and iOS only. Data Sync is a very important factor to have the updated data in all the devices connected with your cloud storage account. Fortunately, all the services come with this feature. Many services have this feature, but the one that I like personally, which supports a huge list of file formats and let you play media files is: Google Drive. Runners-Up: OneDrive, Copy, Dropbox, and ASUS WebStorage. File versioning feature helps to store multiple copies of your document/file. So, those who mainly store and edit documents online, this feature is crucial. In that case, DropBox, OneDrive, or Google Drive fit to the requirement. Runners-Up: pCloud, Inbox Storage, and IDrive. Winners: One Drive and Google Drive. Both of these cloud services are handy to edit text files, Excel files, or other documents. Moreover, these services also let you edit files in collaboration. However, I would go with Google Drive. It is so because it supports a huge list of File Types, extending its functionality to edit those files, and lets you chat with collaborators in real-time. Runners-Up: Dropbox and Box. Both of these services use third-party applications to edit the documents. When I have to choose a particular cloud storage service, the features I consider are: free space, security, file viewer and editor, and supported platforms. Based on these features, OneDrive, and Google Drive are my favorite. So I use these services for keeping the stuff, and working with my documents. However, I must say, that Copy, Dropbox, ASUS WebStorage, and Box also offer a lot of features that one might be looking for. 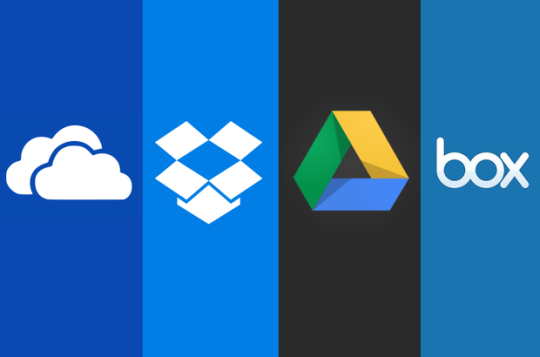 So, which of these cloud storage service is your favorite? Which features are more important for you while deciding on a free cloud storage service? Let me know in comments below.